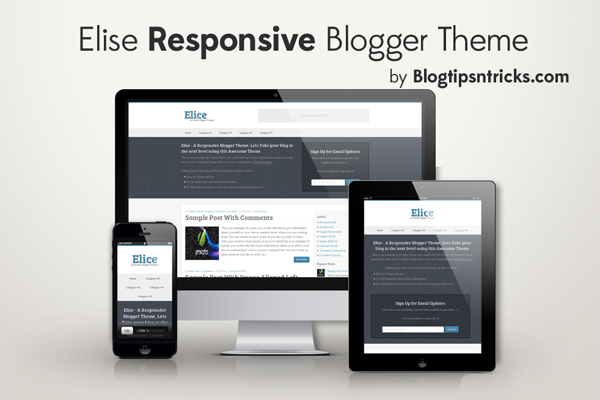 Elice a responsive blogger template, This theme is the first free theme fully designed by me. All the themes Previously published in BTNT are WordPress themes which is converted to blogger Templates. From This theme I've stopped converting other themes to blogger template and publishing it for free (Theme conversion will be made for clients, I haven't made any any changes to services). In future All The free themes from BTNT are fully designed by me. ;) I Hope you like my own designs and give your support to me like you did before. 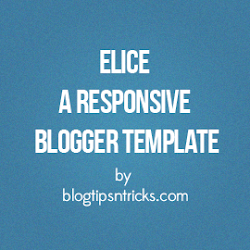 Click the Browse button and locate Elice a Responsive blogger template. The subscribe email location can be a hinder between new readers a blog. Too big with much concentration on it. It's best if put it at right sidebar. Just my 2 cents opinion. It's Really Great One :) Thanks For Sharing With us. Really awesome template ! thx for it! Nice Theme. Responsiveness is much better than any of your other themes. Hey Chandeep, I wonder how you show other webpages without leaving your site. In your hyperlink, add "target=_blank"; this will opwn other web pages in a new window/ tab, the reader will not be leaving your site. For example, <a href="http://www.google.com/" target=_blank > will open the Google web site without leaving your site. Thanks. Thanks but That's not what I meant, click the demo above U will be redirected to ..../p/demo.html?url=http://.... How to do that. Wow, THANKS! I only have a question, How can I put an adverstaiment in the adverstaiment image?? I would like to hide the text: In // // from a Page. Could you help me, please?? I can't get you?, which text you want to hide??? Bro i wants to add elice blogger template header and menu part in Sensational Blogger Template. Sorry bro, Only Ask If you queries related to theme support. I can't help with theme customization. You can add Google Structured Data for your theme??? i really liked the template . is there a way to add drop down navigation menu .. i tried customizing using the html ul tags but it wont work ., can you guide if there is any options available ?? Great template bro ! One of the best templatesi've seen till date . Really cool. Im addicted to this template. Love the awesome white. really nice template. How to add the share button after the posting, in the blogger layout menu it shows enable, in html editor also there is code for it. How to enable it? below that add the following code. Thank you Chandeep, you rock man. Really clean blogger theme. Even I was searching on google on how to enable this share buttons, thanks to you for the help. Hats off to your amzing work. Thanks a Lot! it works great, and I am thinking how to increase the size. 1. I already put my google analytics ID in the setting, but google analytics still showing tracking not installed. I also tried put before the < / head> in the template.. but seems doesn't work. 2. I notice updates of template, what will happen if I upload the new template update? am I have to customise my template start over again. thank a buch for your help. I'm sure it'll work. I think there may be some problem in analytics tracking code installation. The updated template will have h1 tags on post page titles and h2 tags on index page titles. if you update the template you've to customize again. i using this template but i'm confused to put meta tag description and keyword and another problem my blog don't index from google? For meta Keywords just add this code below <head> tag and Replace YOUR-KEYWORD-HERE With your meta keywords. Then to Index your blog on Google you've to submit a sitemap in Google webmaster tool. I haven't added any Light box to this template. I think you're talking about blogger's default light box. Now the index page has h1 tag and post page has h2 tag as heading. I realy love this template but I asked someone about 2 H1 tags in title and heading in a page and they tell me " that isnt good for Onpage SEO ". I checked some wordpress and web 2.0 sites, in the post page they use h1 is heading and title none tag. in the home page they are use h1 tag is title and heading is h2 tag. you mean the background color of the opt-in form. Sure we can change it. Not that opt-in form I just want that light blue theme color to turn into black. The blue buttons to turn into black. please help. Sorry, Please ask queries related to theme support. I can't help with theme customization. Hi Chandeep, How do i change the way i click on my image. The Showcase images with Lightbox is disappear. How do I enable it? I think you're asking about enabling the default blogger lightbox. thank you. it took me awhile until you teach me. Btw thanks for sharing this awesome template. Love it. the blog seems to bright, so is there any possible way to setup a light background or something like that. Thanks for this template, i can try for my blog. I can't upload this theme on my blogspot site. Showing these lines.. Please tell how to upload this template. Hello...why my blog can't install commentluv (IntenseDebate). What can i do it? Is there any way to create submenu items to this theme? But I am facing one issue with mail subscription.. I have tried to change the feedburner ID in code, but when I open the code after saving the template, It shows your feedburner ID instead of mine..
Kindly help me in to this isssue..ASAP..
How do I add social media options on each post? Where do I find blogger Dashboard? Blog is this one: http://vorce.blogspot.com.es/. Timestamp AND date are not visualized. Thanks. Hey, i want to make the opt-in form in the top of home page to side with my getresponce list without changing the designs. How do i do that .. Please help me..
Is there a way to completely remove the gray bar at the top with the sign up area?Just bring where the blog posts start up to the nav menu? I'm having trouble and I'm getting a bunch of errors each time. Thanks. Great tempalte! Great theme and thanks for that. I've tried to change in button css but nothing has happened. I use this theme too. Cool and clean template. But I can't seem to costumize the 404 page. Is it the theme or do I miss something? I tried the "Errors and redirections" thing, add it with some HTML but so far won't show a single thing. Thanks for your time and the theme. Nice theme. I want to make some sub-menu. How ? In these days, mobile increase your relevancyon the web, and more and more people come from mobile devices into my personal blog, for example. If you want to get more environment in your business, need something like this theme. hi Chandeep, ..what template u using for this blog ??,.. .thankz, ..
u have great template.. .
Is there a way to get the image to resize and keep proportions (cropping instead of stretching)? The template is extreamly good and I have applied it to my new blog..
A big thanx for it..
What I want to know is that how can I replace the blog name with my blog logo on the top.. I will be highly thankful if you reply asap. Thank you for that template, you did a good job. I'm trying to change the avatar of the comments [http://img2.blogblog.com/img/b36-rounded.png] and I'm not getting you can help me do this? Here's Brazil for you peace, health and prosperity. Hey Chandeep! I like this template and using it in my blog. But, please give us some new templates like this 'cause I want to change it. How Can Use I Responsive Image in this template? Can I Use Responsive Image in this template? Hi Chandeep, thanks for the beautiful theme. Can you please help me out with these ? 2. Add social sharing icons below posts. I want to change the email opt-in form at the top in the blue box to a contact form. How do I do this? Hi Chandeep, how to download this template? The link doesn't seem to work. Can you please check? My only question is if the theme is able to hold adsense ads properly? Please answer to me regarding this. Sir, One question I missed, i know though it is already seo optimised but i want to know still is there any need to set the custom robots header tags and also I want to add a sitemap page but I am not able to do so please kindly help me in this emergency.I have applied this theme in my blog. Then to add the sitemap you can use the sitemap widget by going to following link. you may already noticed. I've already fixed the download links few days ago. I want to add related post widget in your template,I add this but it can't show. @Rudresh - For me the issue was my latest update was a long post with which probably Blogger itself has some issue. Try using a jump break (available on post create / edit window toolbar) after your first paragraph and it should work. Hi! I just want to say "Thank you very much"! ^_^ I using blogger and you know... I plan to make my own template, but I see my code skill about HTML and CSS is very very bad! But I found your template! "Elice - Best Template Ever!!!" When I try to upload the template I get the following error. Hi Santhosh, Kindly contact me using the contact page. I'll help you. Sorry, I can't help with customized template. @Onani: How were you able to customize the template to that extent? How to add Related post widget (5 square picture stories displayed in Elice blogger template) Google doesnt help as any widget applied doesn't show at the bottom of the post. And social media widget so viewers can share/like posts. Any help regarding this matter would be helpful as the template doesn't include it. To add widgets after the post search for the following code, and paste the widget code after it. Now, Save your theme. That's all!!! You've done a very nice theme, I'm using my blog. is possible to inset Adsense ad in Post center ? When I try to search for the opt in inner portion to change the background, I can't find it in the template. Is there a way to expand the entire template so that I can find it? Never mind - I figured this one out. Horrible, I tested this template and decided I didn't like it however when I uploaded my old backup this template somehow left traces on my blog that I found very awkward to remove. I would suggest that you expand your documentation to include troubleshooting. Might be nice for a new blog but I wouldn't recommend it for existing bloggers. When user viewed on mobile he need to tap the side to view whole website. how can you fix this on your responsive themes? How to Remove Opt In Info Skin from template? HI Chandeep. I am very glad to use your template it has added a new touch to my blog thank you very much for this wonderful theme. I really love this template!! The only thing I'd like to change is the social media icons. I have my own to use. Could you please tell me how I can go about replacing them? Thank you! The template is extreamly awesome and I have applied it to my new blog. but how do i align post images in center below post description instead of left side in home page. naan home page la irukura subscription blog edit panniten email id kuduthu sign up kodutha ennoda feed burnerku than poguthu. but blog post la side la irukura suscribe for newsletters btnt ku than varuthu epdi edit panrathu? i must say, a great template. The template is nice, ask permission to use..
how to use related post in this template? PLEASE HELP WHILE UPLOADING IT WAS SHOWING ABOVE MESSAGES IN BLOGGER. Hello bro I want to hide labels what I do? What's wrong? Google help forum say: Perhaps in reason of an Blogger-Update now the third party template no longer work correct in some areas and i should contact the publisher - hopefully, the template publisher can sort aund fix the problem. So i do. Could you help? Very nice blogger template. I've found you on Google and you are such a pro blogger. Love you Chandeep bro. Keep it up on. View my blog http://techfrnz.com also and suggest me for gain traffic to my blog. this template is not downloading. plz rectify the issue. How can i add custom author bio below each post?? Download link don't work, can you provide new link ? This is one template I was able to upload and edit my self on my blog www.Mozentre.com Nice on chandeep I've grown a soft spot for this blog now. Hi Chandeep, one of the few elegant looking responsive templates. Good stuff. My blog is full of 16:9 images and videos. Can you help me change the aspect ratio of the thumbnail images and the post summary images from square to 16:9 rectangle? Can I add related posts option and author bio below the posts? You've done a great work br Chandeep J & Blogtipsntricks. I'm unable to download this beautiful template sir, I don't know what happen. Here is my email address sir. I have installed elice template on my blog, but I want to remove the menu tabs and social top icons. Please how can i make the Menu bar Sticky? Hi Chandeep, This is a great blogger tamplate, I have recently uploaded looks nice. I thing it's a shame your blog has no search field. Hi chandeep, please how can i add the bigopt-in form to btnt template@ thanks. Hi Chandeep, I failed to download. Any reason for that? I've send my comment about your previous theme published. btnt theme. But there something unusual now, you can see my blog www. fathurhoho .id , missing header (main navigation menu) and footer, it's happened too in your blog. What's wrong? Superb Template. But I am facing a Bit Problem. Adsense not showing when I Paste the Code on "header-right" from the Layout. This is the Blog. Can I remove the Link http://www.tozilnutpam.com from the footer Credit? Because that Blog is no more active.